Growth Habit: Bridal creeper is a woody vine with sharply pointed, glossy green leaves. It has an extensive tuberous root system. The green stems twine around other vegetation for support eventually smothering them. The stem has a zigzag appearance changing its direction at each node. Type of plant: Climbing, perennial herb. Flowers: Flowers are greenish-white and occur where the leaves meet the stem. Fruit/Seeds: Black shiny seed is contained in the ripe, red berries. Dispersal: Bridal creeper has in the past been planted as an ornamental. In bushland situations it is usually spread by birds feeding on the fruit. Earth moving equipment may unknowingly move parts of the tuberous roots to other locations. Distribution: Bridal creeper is causing some severe problems where it has naturalised in Victoria, New South Wales, South Australia and parts of the York and Eyre Peninsulas. Although it has occurred in spot locations in Tasmania, it still appears to be quite rare here. 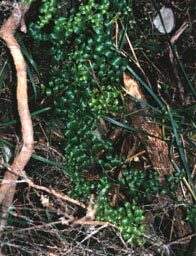 Status: Bridal Creeper is declared a Noxious Weed in South Australia and it is a Secondary and Prohibited Weed in Tasmania. Because of its extensive tuberous root system Bridal Creeper is able to withstand temporarily unsuitable weather conditions and this also makes it quite difficult to dig out. Any tubers left in the ground will re-shoot. It prefers moist gullies and sheltered positions. In woodlands it can completely cover and therefore dominate the native understory. As a Prohibited Weed, it is illegal to move Bridal Creeper from one place to another in the state. Bridal Creeper has been used as an ornamental plant and the foliage as a major constituent in floral arrangements (bridal bouquets) for over 100 years. Because it is not yet widely naturalised in Tasmania, prompt action to remove it whenever it is noticed is the best way to protect our valuable conservation areas and bushland reserves. The DPIF would like you to ring for advice if you think you may have located Bridal Creeper growing in Tasmania. For further information on Bridal Creeper contact the Department of Primary Industry, Water and Environment, Tasmania. Grubbing and burning (all year). Bridal creeper is very tricky to control. Improper practices may actually help spread the plant. Contact D.P.I.W.E. for specific information in controlling bridal creeper.